Auto-braking mechanism comprises a friction clutch. When the winch cable is wound in (raising the tower, column or pole), a conventional ratchet is used.When the cable is wound out (lowering the tower, column or pole), a friction clutch is engaged.The greater the load, the greater the clutches holding capacity. If the handle is released, the load is held on the clutch and is fail safe. Winch-drum guard. 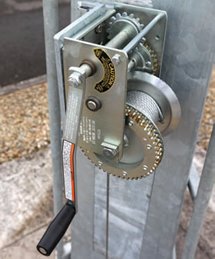 On DW1000 and DW1500 winches a guard is fitted as standard.This reduces the possibility of anything getting trapped in the gears of the winch during operation such as loose clothing, etc. and also reduces the possibility of the drum gears getting damaged. Large diameter drum core. 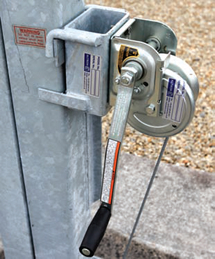 Reduces flattening and kinking of winch cable, extending the usable life of the cable. Gearing ratio. The gearing ratio used on all winches stops the winch being overloaded by manual winding of the winch handle. A specific design feature, when the winch is used correctly, the pressure on the winch handle required to overload the winch is greater than can be applied by hand. Therefore under normal conditions when the winch is used in accordance with our operating instructions and with camera equipment within maximum rated, winches cannot be overloaded. Altron winch kits are designed to be as simple and safe as possible to use, but as with all mechanical equipment, require correct operation and regular maintenance to ensure safe and reliable on-going use. Prior to raising or lowering any Altron tilt-down products, the operator should have thoroughly read the operating instructions supplied and should be familiar with the winch operating procedures and the possible risks involved. Instructions are always available by contacting Altron and regular training courses are run at our offices. Altron winches are mounted in the optimum position on all products, so that only balanced loads are applied to the product and winch mechanism. This gives an increased life span for the winch and pulleys and reduces maintenance due to wear. 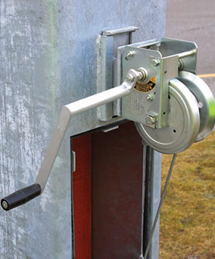 To achieve this, winch bracket and handle combinations vary between product types. Each winch unit has a part number and serial number and it is imperative that the correct winch unit is used on each product. Winch part numbers are noted against all products in this catalogue. The photographs below show the three sizes of winch that we supply and also the three bracket mounting types. DW1000 Winch mounted on ACC2BPLA column.This bracket type for ACC/ACT columns and towers. DW1500 Winch mounted on AW1545/TD pole. This bracket type for tubular poles. DW2500 Winch mounted on an ANCT tower. This bracket type for ANCT towers only.